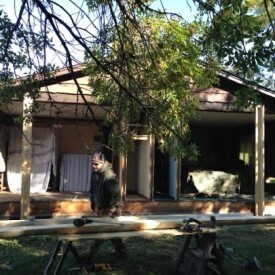 The staff and crew at 888-LOG-GUYS are dedicated and loyal to its clients. We sincerely care about you, your well-being, and the quality of your log home or log cabin in the Covington KY area. You will find our office team to be very helpful and knowledgeable in the field of log home restoration. Not only do we excel in restoring log homes, but we also have several years experience in log home repair, log home chinking and caulking, log home improvement, and log home maintenance. No matter what your log home problem or log home care may be, let us do the work! We start with media blasting to strip the old stain, and then sand your logs to a smooth finish. Next, we clean the logs with a borate treatment that also works as an insecticide. Then, we seal your log home with chinking or caulking. 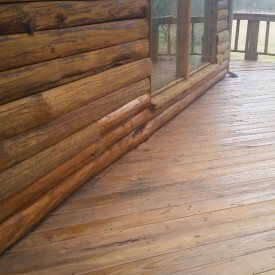 Lastly, we apply the best stain product for your log home to make it look amazing! 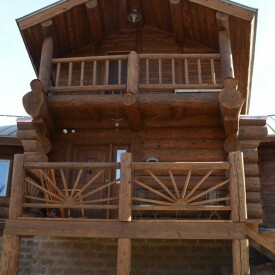 You will be beyond satisfied with how your log home looks once it has been restored! Call us today to discuss how we can restore your log home and give you a free estimate! If you have log rot, we can either repair or replace your logs that are damaged. If your logs have been invaded by insects, bugs, bees, or birds, then we can repair the logs that are damaged. If your log home or log cabin has been affected by settling or severe weather, then our company can fix that! We have the capacity to fix just about any log home, no matter what the cause of the problem might be. Call us for a free log home repair estimate in the Covington Kentucky area! Don’t let unwanted water, air drafts, or bugs and insects invade your log home or log cabin! Our crew can repair or apply an energy seal that will keep nature’s elements out and allow you to have a cozy and comfortable home. 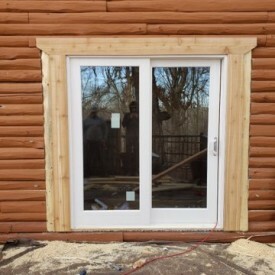 When an energy seal is properly applied in between each log, like how the 888-LOG-GUYS do it, it prevents water leaks, air drafts (even around windows), and bugs or insects from coming into your log home. You don’t have to put up with those log home problems any longer! Ask for a free estimate from our website, or give us a call! If there is something you would like to add onto your log home, then call 888-LOG-GUYS to do the work! Please tell us what you want your log home to have and give us your ideas. 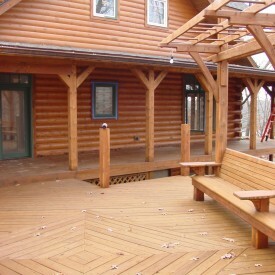 Our company can construct your ideas and make them a reality to add beauty and value to your log home. We can build decks, porches, and patios. We can construct and even repair log staircases and log railings. We know that your log home is an important investment, and you want to make it the best it can be. So, don’t delay! Give us a call, and let us know what we can do for you! Our dedication to your log home health goes beyond the finished project. Our staff knows that each log home has to be properly maintained every several years, and 888-LOG-GUYS will keep track of when your log home is due to be cleaned and covered with another top coat. You can trust us to make sure your log home or log cabin in the Covington KY area stays in excellent condition. If the unexpected happens, we will be there to fix the problem. You can depend on us to always be there if issues arise. Don’t wait any longer! Ask us to give you a free quote over the phone or from our website!